Cerberus FTP Server 2.46 is ftp servers software developed by Cerberus, LLC. Cerberus FTP Server provides industrial strength secure SSL/TLS encryption and powerful FTP server performance without sacrificing ease-of-use. 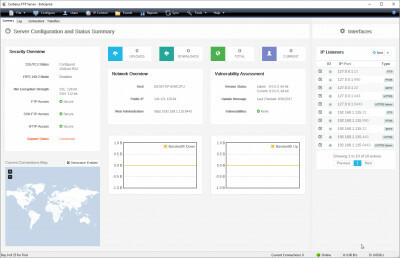 Designed to use very little CPU and memory, Cerberus features a user-friendly interface that can be easily hidden or accessed from the system tray.The server can integrate with Active Directory, run as an NT service, resume failed transfers, and offers an easy-to-use manager for controlling user access. This servers software is shareware, which means you can download and use Cerberus FTP Server 2.46 for free during the trial period (usually for 30 days). At the expiration of the period you will have to buy the ftp servers product for $59.00. Cerberus FTP Server 2.46 is available at regnow and Cerberus, LLC website. Cerberus FTP Server 2.46 supports English interface languages and works with Windows XP/Vista. We have tested Cerberus FTP Server 2.46 for spyware and adware modules. The software is absolutely safe to install. We has completely tested ftp servers software Cerberus FTP Server 2.46 many times, written and published the interesting article and uploaded installation file (1658K) to our fast server. Downloading Cerberus FTP Server 2.46 will take minute if you use fast ADSL connection.